Laying on a gurney at the local morgue was not how Etienne Argeneau typically spent his nights. Yet there he was again, and this time he was followed by an ax-wielding maniac intent on seeing him dead. And when the lovely coroner is mortally injured defending him, he is forced to make an impulsive decision. He decides to turn her, to have her become as himself, what many call the vampire. It was a life or death decision, and he chose to give her life. Learning that the maniac who attacked her was telling the truth, that there was indeed a vampire in the morgue, didn't calm Rachel Garrett. Especially after she learns how she has been "saved". But she never wanted to be a "soulless blood-sucker". She simply wanted the promotion that would move her from the grave-yard shift. Now she found herself smack-dab in the middle of a grave-yard shift life! What was a new vampiress to do? Go to the bridal shower of Etienne's sister?? Maybe this family was just a little too normal. There was the interfering mother, the brooding elder brothers, and the smitten newly-engaged younger sister. Rachel quickly found herself adapting to her new life. And anything that she didn't know, Etienne's mother was more than willing to divulge, much to her embarrassment, and growing fascination - for she found herself hungering after Etienne more than even her new blood-lust. 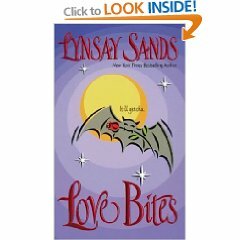 Lynsay Sands continues her new twist on the vampire genre. This is Etienne's story, whom we met in Single White Vampire. It runs along the same time-line as SWV, and although they are about brothers, they completely stand on their own, and can be read in either order. Readers will delight reading about Etienne, who is a light-hearted vampire who must overcome his guilt at forcing Rachel into her new life. I look forward to more stories of the Argeneau family.